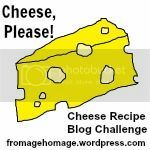 Oh blog I've missed you. To be honest, I have no exciting reason for being away - I've just been busy. But nonetheless, it's lovely to be back. 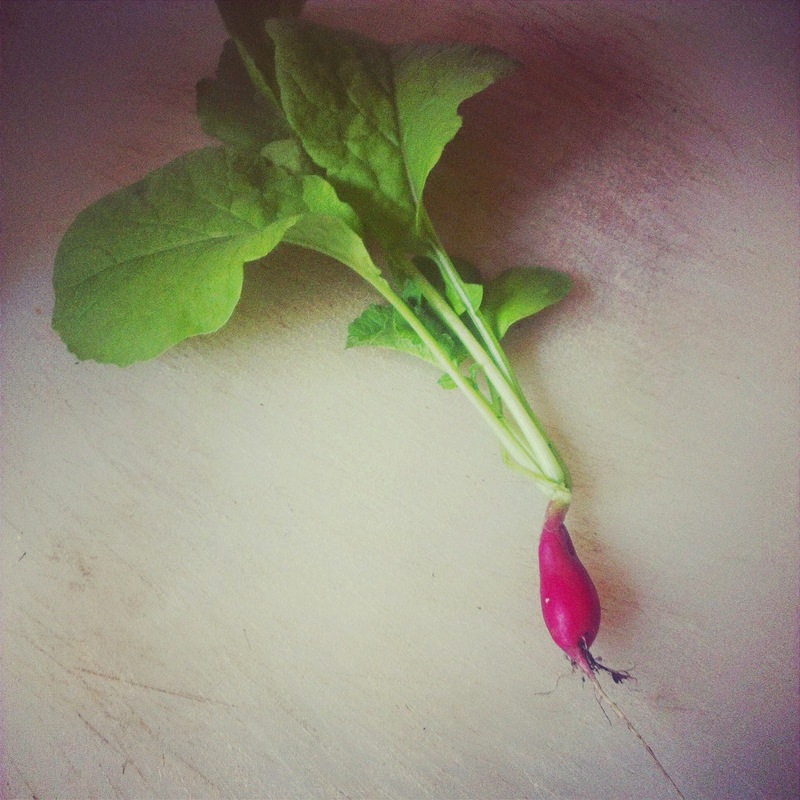 Even though this post isn't a food post, it's another gardening post because I grew a radish. Look at it, it grew! And on my windowsill! I probably should've left it a bit longer but the tension was killing me, and I really wanted to pull it up. But there you go, hello and look at my radish! Time for a little patronising history lesson, the year was 1850ish, Italy had just been reunified but there was a big divide between the rich and poor, with the poor getting ever more dissatisfied. So the Queen Margarita went to a restuarant in Naples and ordered a pizza with mozarella, tomato and basil, the colours of the new Italian flag. Et voila, a new classic was born. I love making pizza, and it's a great way to get kids interested in their food. They can roll out the dough and pile it high with stuff, just be careful of mozzarella because it spreads and will drip-drip-drip into a gooey mess at the bottom of your oven (I say this with experience). This is a slightly spruced up margarita as it involves a bit more cheese - first a thin dusting of hard cheddar (I used Morisson's Welsh Cheddar), the added morzarella before topping with crumbly feta (or Morrison's 'salad cheese'). Then topped with basil when it was cooked. 1) Sift the flour into a bowl and then add sugar and salt, incorporate the milk bit by bit into a well in the centre and bring together the form a dough. You can warm the milk up, but I always forget and it doesn't do me any harm. 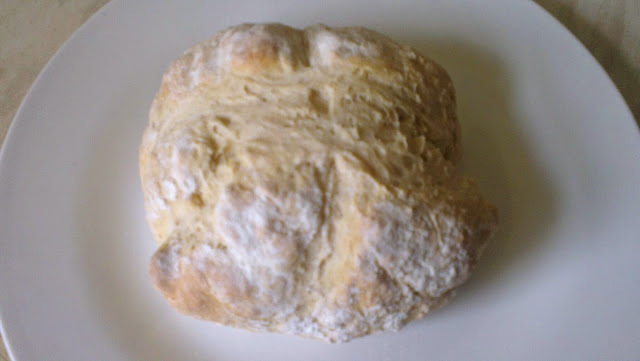 2) When it's a ball of dough, turn onto a floured surface and knead, knead, knead. It will take a good 10-15minutes, but it will be worth it. It's ready when the dough feels smooth and is stretchy. 3) Roll out the dough to the thickness of a 2pence piece, or around 5mm, thin enough to cook quickly, but also take the weight of your toppings. 4)place on a tray and begin by adding tomato puree, leaving a crust around the outside, then lay on the rest of your toppings. 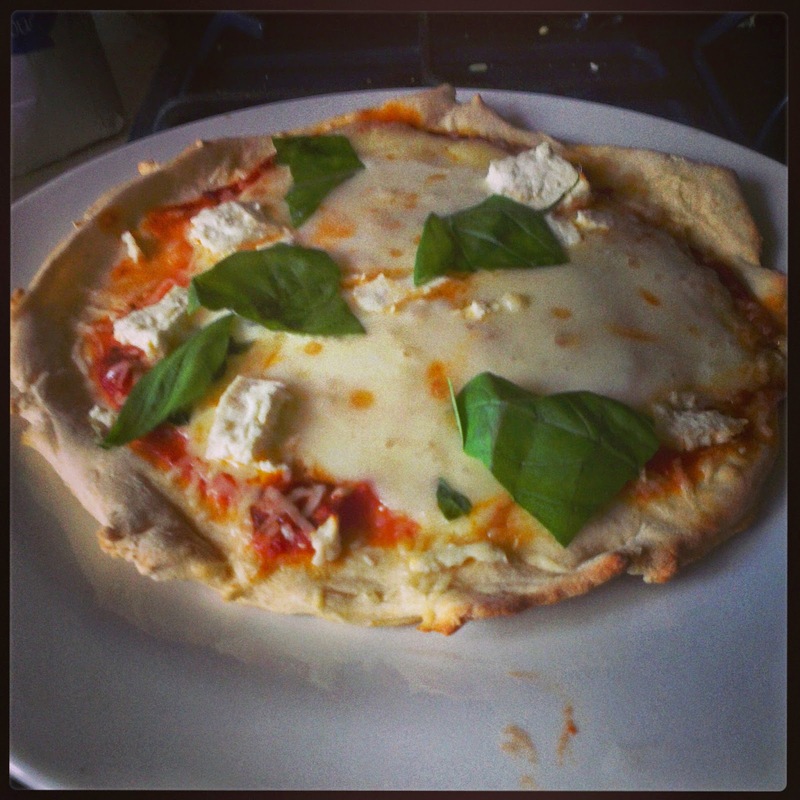 5) place in an oven around gas mark 6 for 10-12 minutes, until your cheese is gooey and your dough looks crispy. Serve and enjoy. When I read jibberjabber UK's brief of a vintage cake, I scrolled through webpages and recipe books. Didn't all cakes scream vintage? Without sounding like a cake xenophobe, apart from your panetone, French patisseries and fingle fangled American cupcakes, don't all British cakes come from a time when tea dances were the norm, cars were prettier and chilvalry (and institutionalised misogyny) was alive and well. Then I realised I was sitting on a recipe, a recipe that must date at around 1940, or even before that if my Great Gran got it from her mother. It's a proper vintage recipe, passed through the generations through word and aging yellow pieces of paper and it comes from my great grandma Nelly. My great grandma Nelly was a culinary force to be reckoned with, she taught my grandad to cook, she taught my dad to cook and through a sort of osmosis, I suppose she taught me to cook. I only met her once or twice as she died when I was quite young, and even then the memories are mainly of permed hair, hospital beds and cheap sandwiches. She was an English woman married to a stout ship builder from Port Glasgow and responsible for one of the hardest cakes I have ever tried to master - the chocolate button cake. Now I hear you ask, what's so hard about chocolate button cake? Well it turn out a surprising amount. When I was young my dad and I spent weekend after weekend pouring over this small scrawled recipe that sounded so simple, after all it was essentially throw everything in a bowl, mix and bake. But time and time again there would be a beautiful sponge on top and a thick gooey layer of melted chocolate at the bottom, completely unlike the original where little pockets of chocolate heaven could be found evenly throughout. But one magical weekend, we cracked it and now I present to you lovely readers, a Murphy family secret recipe. 1)Begin by creaming together the butter and the sugar with a fork until it's smooth. 3) Now add the flour and beat until its all incorporated. You can use a mixer if you have one, but I don't so I use a wooden spoon (true to the vintage theme). 5) if your mixture looks too stiff add the final egg and give a good beat. 6) I place in a large cake tin and bake for 30mins, slicing in half to sandwich. But you could divide into two tins and bake for 20minutes, either way it's at gas mark 6, until golden brown. To check the cake's done insert a knife in the middle if it comes out clean (bar a bit of chocolate), it's done. 7) Leave to cool in the cake tin and then turn out to cool a little longer. 8) Decorate as you see fit. 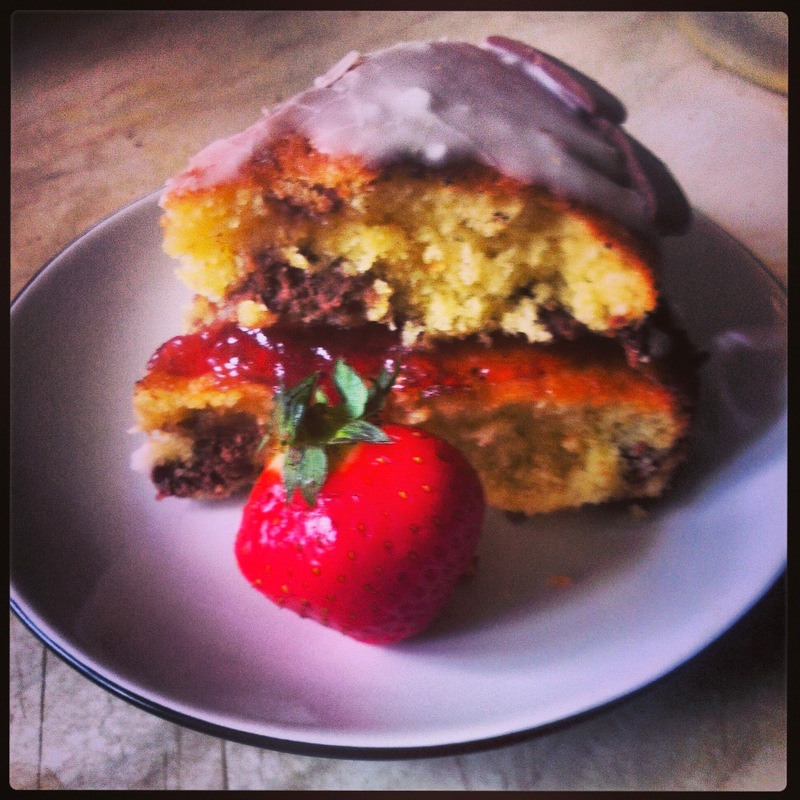 I've halved mine and then sandwiched back together with strawberry jam, then topped with a lime icing (just a little lime juice and icing sugar), it gives it a little touch of a modern edge but without losing that all important vintage feel. Th oother day I stumbled across a recipe for pickled chillis that took all of 5 minutes to complete. I can't find the link to the recipe so if it was your recipe I've stolen, I'm really sorry - if you message me, I'll add a link. It's also much cheaper than I thought it'd be. I generally have white wine vinegar in the cupboard and to make a small jar used around half of 59p 250ml bottle. Add to this the 45p for a bag of mixed chillis, plus 13p for two loose jalepenos and you fall way below the old el Paso price. 1) Begin by sterilizing your jar, you can do this in warm soapy water, or the oven. It's worth looking up different techniques for this as I'm no expert. 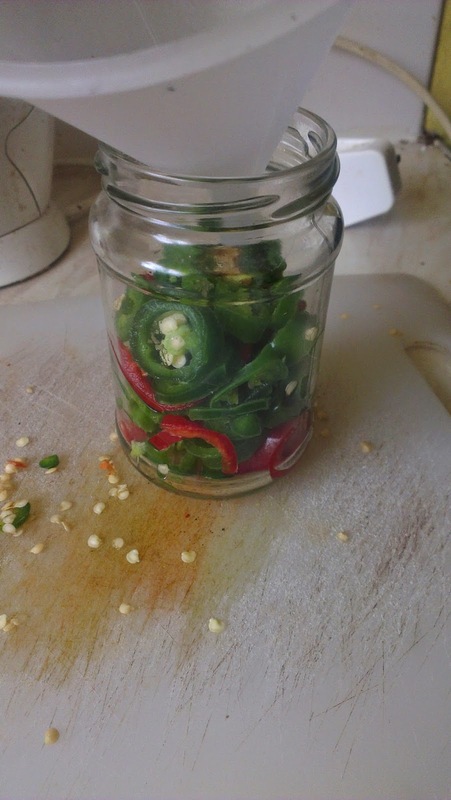 2) Chop your chillis however you choose and place them in the jar. Then cover in vinegar to see how much you need, pour the vinegar into a saucepan. 3) Add the sugar and salt to the vinegar, then bring gently to the boil. When the vinegar has been boiling for a minute or two, pour it over the chillis. Leave for a few mins before placing the lid on the jar. Be careful adding hot vinegar to the jar if you haven't got a funnel kicking around. To be honest, I can't really remember why I have a funnel kicking around. I've only had mine in the fridge for a day or so, but I hear they get better as they age andwill keep for a few weeks. The astute of you will have noticed a huge burger in that picture at the top. I had 500g of pork mince that needed to be used up so I added 2 handfuls of bread crumbs, a tsp of paprika and 2tsp of mustard and kneaded it all together. I then made 4 patties and put in a medium oven for about 30minutes. They are the best burgers I've ever made, the breadcrumbs keep the juice in and they're just the right level of spice. You could of course fry or bbq them, but if you want them out of the way the oven is your friend. To make the coleslaw I simply slice and onion, peeled a carrot and added 4tsp of yogurt. 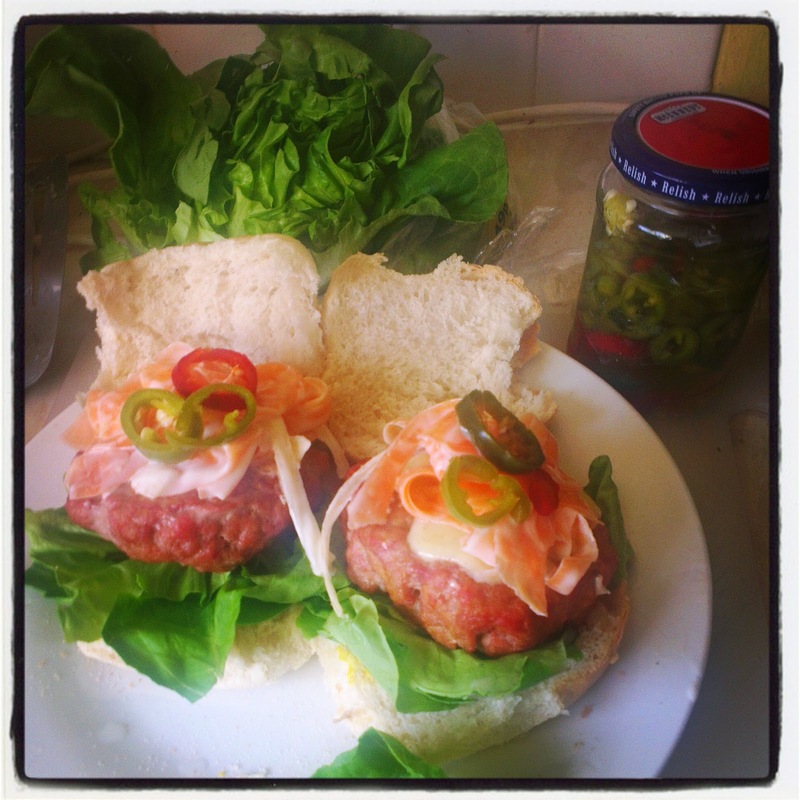 Then I stacked everything onto some delicious buns and added some chillis. Perfect summer food. About a month ago I bought a sad little pot of 'grown your own basil' from Wilkos for 25p. Despite all of my predictions and accidental attempts to kill it, it grew. 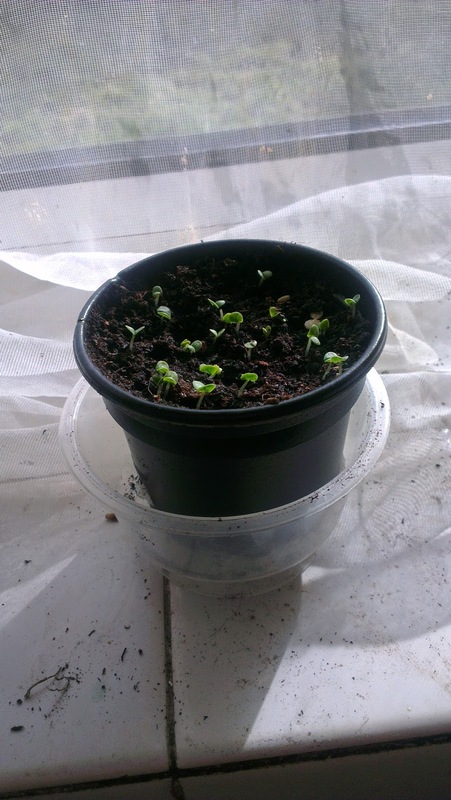 As more and more little seedlings began sprouting up - not looking disimilar to a platoon of the space fighters Luke Skywalker used to destroy the death star - I was bitten by the gardening bug. I picked up seeds (50p from B&Q, or two for £1 from the JMart next door), some cheap compost and planted to my hearts content. And before I knew it things were sprouting up all around me, my chillis grew despite my need to uncover them every 5minutes to see if they'd germinated; the sage sprouted forth like little Audrey IIs and the spring onions have just started to sprout despite being in an ice cream container. It hasn't all been happiness and rainbows - my sage now only has one stork as the others mysteriously dropped off, I also planted my chillis like an idiot, so I'm going to have to try and separate them into different containers. 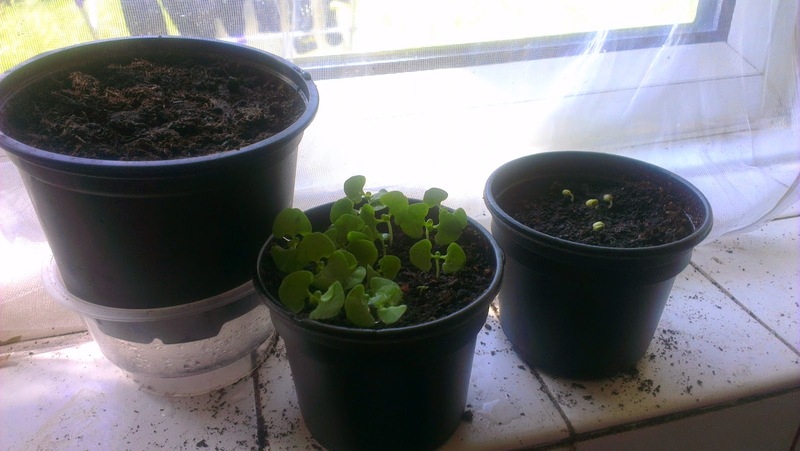 But the positives definitely outweigh the negatives, and it shows what you can grow on half a kitchen windowsill. My next dreams are a little more ambitious, carrots in old mouthwash bottles, empty mince tub lettuce, and I'm sure there will be some catastrophic failings in there, but hey - I'm learning. 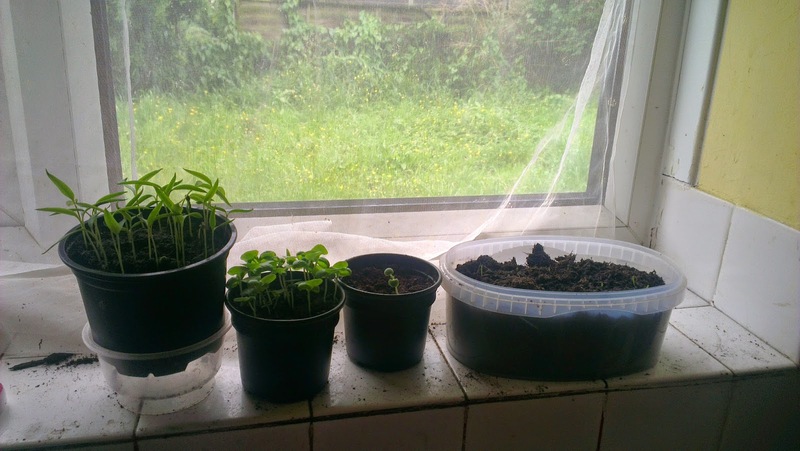 If you don't have a garden through cautious wind to the seed packet instructions and shove some seeds in some compost and pop it on the windowsill. I do actually have a garden, although only half of it is mine, and the half that is mine is used as a back passage for the late night drug dealers and assorted night goings on that I'd rather not know about. Only the other night a torch light shone on me as I was watching TV, and a potential burglar was left disappointed that I was in. What chance would a spring onion have? My point though, is that when 6 spring onions can cost up to £1 and you can get over 50 seeds for 50p, why wouldn't you want to grow your own? Every so often I get asked if I'm Irish, then in my slightly posh-slightly West Country accent, I reply that I'm Scottish and it throws them slightly. However, any Irish genes that stay from the time my ancestors crossed the sea to Scotland have left a slightly racist love of potatoes, soda bread and a good sing song. It remains perculiarly hard to get good soda bread or soda farls in England. But its so quick and easy I never want to pay ludicrous prices for it again, It is quite possibly the easiest bread I've ever made, and for 21p a small loaf can be yours. If you don't believe that butter milk is cheap you can get enough to make this recipe 3 times for 50p in Waitrose. That's right, Waitrose. 1) Begin by sieving your flour and adding your salt into a mixing bowl. 2) Next create a small well in the middle of your flour and slowly pour in the butter milk stirring as you go. 3) when it's come together roughly, turn onto a floured surface and knead for a minute or so. It needs very little, and the trick is to work quickly so the buttermilk and raising agents in the flour can work in the oven. 4) Place on a baking tray and make a deep cross about 3/4 of the way down with a knife, brush with milk (I forgot the milk, yours will be more golden than that) and bake at gasmark 6 for about 30minutes until the bottom sounds hollow when you tap it. This morning I had a terrible moment when I looked in the mirror and I couldn't see my chin. I could see something, but rather than being something defined it was... well it wasn't. My weight has always fluctuated, but I've decided enough is enough. No more large portions, no more picking at leftovers, no more *gasp* chocolate. Chocolate is my nemesis. I can demolish a large bar in minutes, chocolate mousses are inhaled and chocolate biscuits just disappear. It's all (mostly) chocolate's fault. 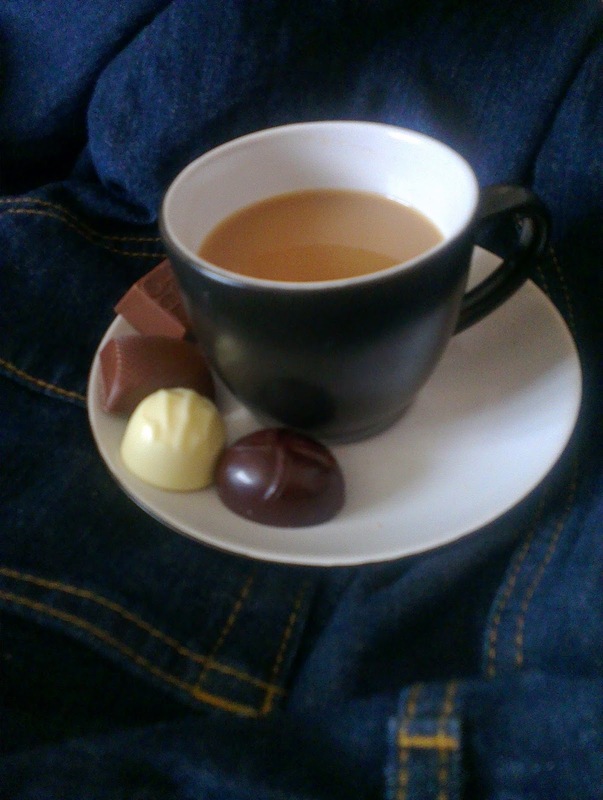 But a couple of other things made me realise that it isn't always chocolate's fault. I found out that cooking lessons aren't compulsory at my old school, for any age. This shocked me more than I thought it would. Sure, my dad taught me how to cook, but I learnt the technical processes at school explained in simple ways (gelatinisation in bechamel sauces are because flour molecules pop, in pastry the butter makes a rain coat for the flour). If you don't know how or why things work, will you be quite so experimental in the kitchen? Today is Jamie Oliver's Food Revolution Day. A time to make us think what is in our food. When I cook food, I know what's in it. I think. But I don't, I couldn't tell you how many calories are in a piece of lamb, or homemade bread, or how much vitamin d is actually in kale. It comes down again to education, we need to learn about food at all ages. I will certainly be watching much more carefully what I put in my food. In the meantime, goodbye, chocolate, I'm going to miss you.